My son recently brought home a school project. His class would be making a cookbook with recipes submitted by students' families - and bringing samples to school. How cool! Well, the possibilities were endless - what to choose as our submission? As the recipes were to be culturally relevant, I wanted a German inspired dessert. Something easy, but special. I planned, researched, tested, and submitted samples to my family. These Black Forest Bites were the winners (though German Chocolate Bars were a close second - recipe to be posted soon). 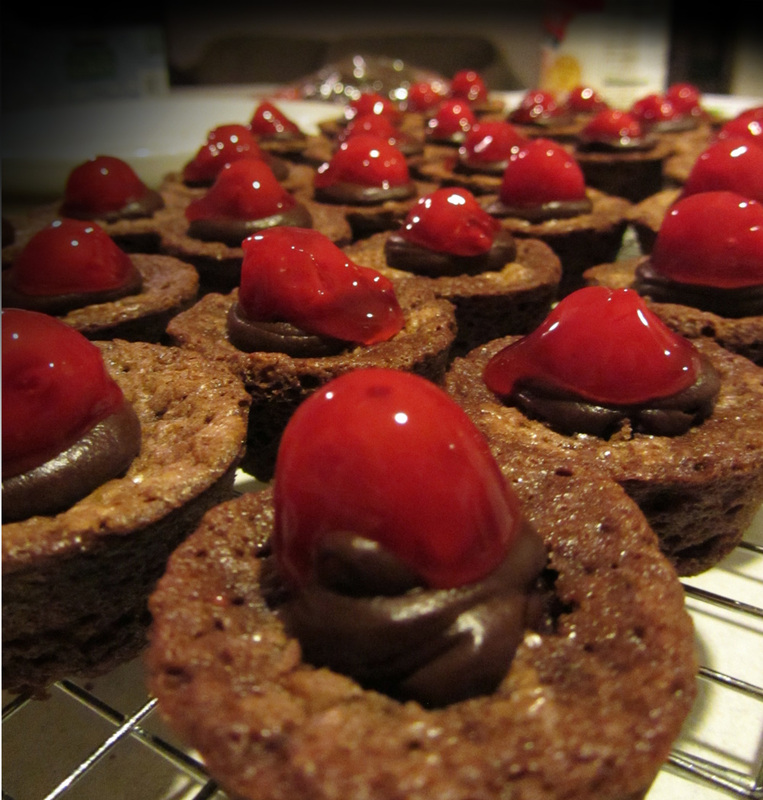 These little filled brownies are bursting with chocolate cherry, Black Foresty, goodness. They're a definite must-try! 1. For the Ganache: place the chocolate in a medium bowl. Microwave on low until the chocolate is just melted and smooth, stopping to stir often. 2. Add the cream to the chocolate. Microwave for about 10 seconds (just to warm up the cream). Whisk until smooth. 3. Whisk the butter into the chocolate mixture until the butter is completely melted and the mixture is smooth. 4. Whisk in the preserves and the cherry extract. Set aside (do not chill). 5. Preheat the oven to 350°. Grease two mini-muffin pans. 6. For the Brownies: combine the semi-sweet chocolate with the cocoa powder in a medium bowl. Toss. Add the butter pieces. Microwave on low until the chocolate is just melted, stopping to stir often. Mixture should be smooth. Set aside. 7. In a medium bowl, whisk together the sugars, espresso powder, baking powder, and salt. Add the vanilla and eggs and whisk until smooth. 8. Slowly whisk the chocolate mixture into the egg mixture until thoroughly blended. 9. Sprinkle the flour over the top of the batter. Stir just until no streaks remain. 10. Fill each muffin cup about 3/4 of the way full. Depending on your muffin pan, this should be about 1 - 1-1/2 tbsp of batter in each. 11. Bake the brownies for about 10-15 minutes or until a toothpick inserted into the center comes out with only a few moist crumbs attached (tops should look crinkly). 12. Transfer the pans to racks to cool for five minutes. 13. Run a knife around the edge of each brownie and gently lift until it releases from the pan. While still in the pan, use your thumb or other utensil (I use the handle tip of a meat pounder) to make an indention in the center of each brownie. 14. Transfer the brownies to racks to cool completely. 16. Pipe the brownie indentions full of ganache (so that the ganache just overflows each hole). 17. Use a fork to strain a cherry from the goo. 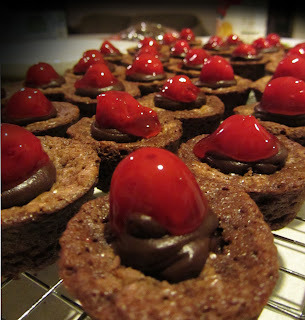 Press the cherry lightly into the ganache center of a brownie. Repeat for all remaining brownies. 18. Allow the brownie bites to set until cool. Serve!